Mother wanted drama for her new Rolleiflex camera. 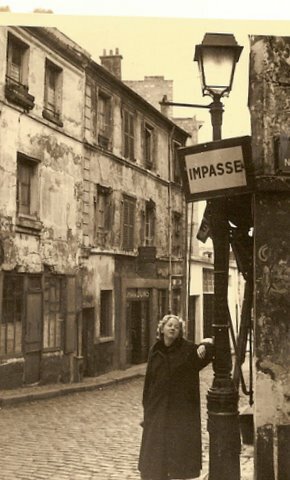 Paris 1953. Well it’s just about upon us and I imagine most of you have big party plans. I have to confess New Year’s Eve is not a favorite holiday of mine. I gave up accepting ALL New Year’s eve parties some years ago. I prefer to stay in comfort of my own home with my dog planning for the coming year and having a glass of vintage Pol Roger at 9:00 as we watch the ball descend in Time Square. And I go back so far it was Guy Lombardo I heard play Auld lang Syne as I sipped my champagne. Sometimes when I’m cozy in bed with Rennie my wire hair daschund snuggling close in the dark I play my IPod and do a bit of looking back as it plays I Left My Heart in San Francisco, Spanish Eyes, Autumn in New York, April in Paris and At the Balalika, Then to sleep to start a new year filled with enthusiasm for the future. So what can I blog about New Year’s? Well since a trip to Paris is on the books for the coming year, let’s talk Paris past that comes alive as I play the music of Aznavour, Trenet, Montand, Gainsbourg, Piaf, Chevalier. I’ll just turn on my IPod to them and tell you a story or two. Paris has actually been very much on my mind having just seen Midnight in Paris for the second time. When I first saw the film I thought of writing to Air France and suggesting they put a kiosk for booking flights to Paris in the lobby of every theatre playing the film. The people may sometimes infuriate me but I, like so many others, have a love affair with the beautiful city. 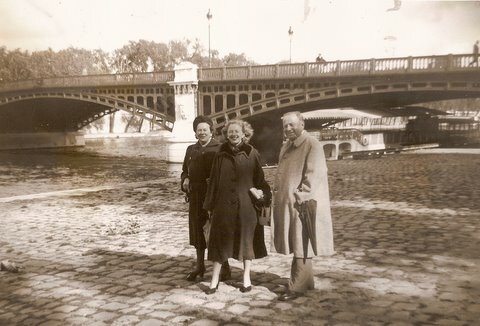 My first trip to Paris was in 1953 with my parents. Taxis were old broken down Citroen with drivers who wore black beret and all had a burning Gauloise cigarette hanging out of the corner of their mouths. And frequently a dog sitting in the passenger seat up front. They never understood my French directions, or if they did they pretended they didn’t. Oh yes and they all tooted their horns loudly and constantly. 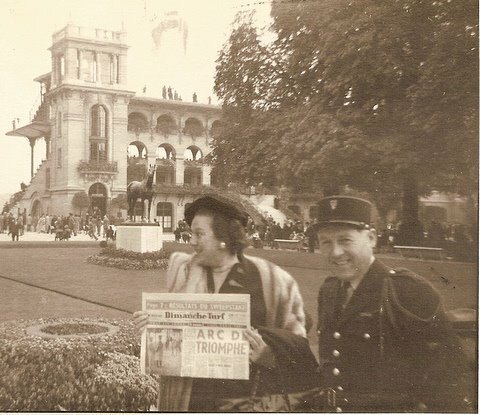 Paris 1953. One of my favorite photographs in any of the albums. There were public bathrooms for men on every other corner called pissoir and if you left your date to go to the ladies room in a bistro you’d probably run into him coming through another door into the area you were entering for women because they were one and the same. And the bathroom facilities in some places were really only a couple of steps ahead of the kind I find in remote areas of China. 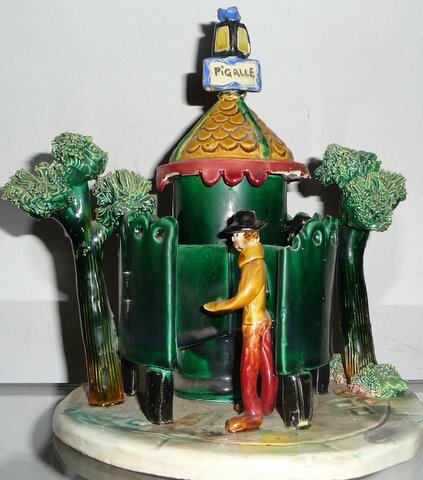 Look at the 1953 souvenir pissoir I brought back from Paris I've just located hidden away on a top shelf in a back closet. American customs agents didn't know what to make of it when I came back into the country. 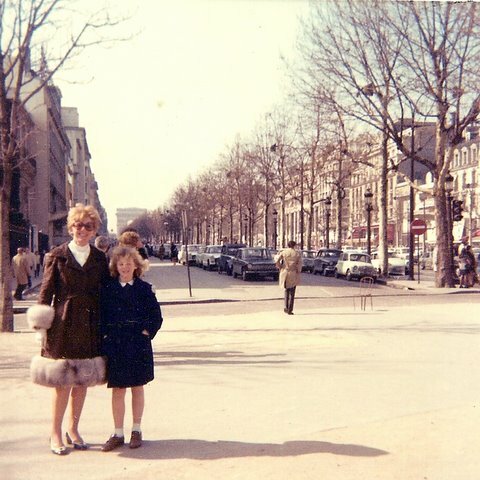 I remember just the shop on the Rue de Rivoli where I bought it. They sell mainly tee shirts now! But in 1953 a ceramic pissoir that held cigarettes was a big deal. 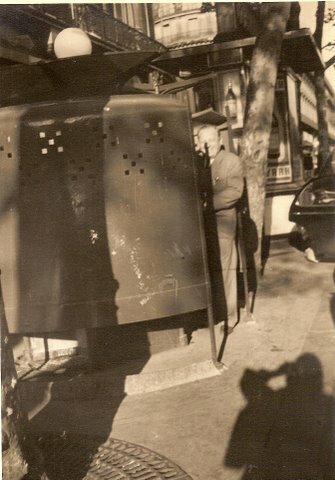 Mother was carried away with her new Rolliflex camera and insisted daddy pose at a pissoir. There were great cabarets. 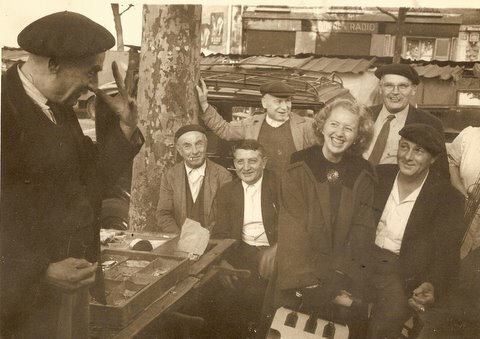 That first trip in 1953 my friend David Morgan flew to Paris to show me the Paris he knew when he’d lived there. 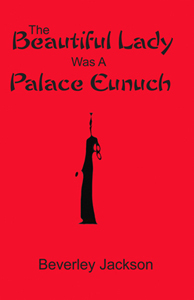 That meant magical night clubs like L’Elephant Blanc or Les Ambassadeurs where 20 violinists would serenade at your table, Russian cabarets with gypsy violinists and Cossack clad waiters rushed around with flaming shish kebob on swords. The influence of old Russian was there. Then late at night we’d go to some of the popular Black Jazz places for great music. And as night eased into day it would be hot onion soup in the bustling market Les Halles where Paris was preparing another day. It was all very romantic. 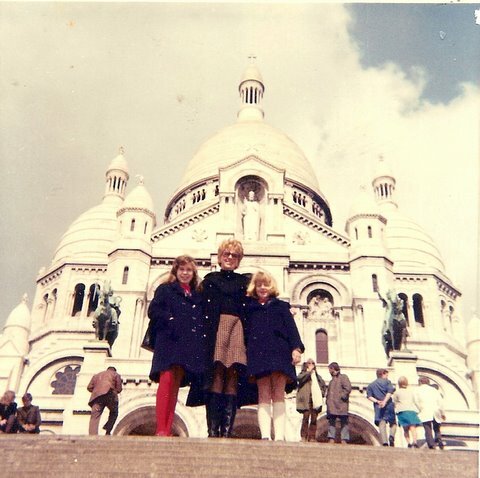 Yes, I’ve been madly in love with Paris and in Paris. The latter once in my youth and once in middle age. Now I’m only in love with Paris. At that point I pulled myself together and asked if I could interview him. “Yeah, come right over to the Biltmore and have dinner with me. I don’t like eating alone!” he ordered. “Well I have a young daughter here I can’t leave and it’s too short notice to get a sitter.” “I’ve got a young daughter too. Bring her along.” And he hung up. So we got out of our blue jeans as we called them then, dressed up and went off to a wonderful evening with Art Buchwald! 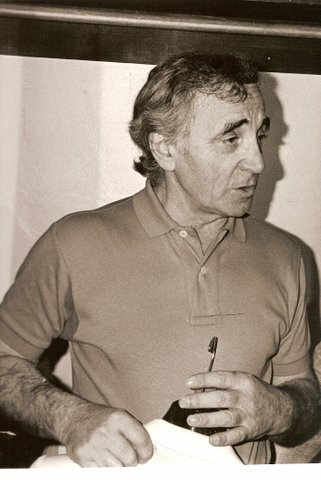 “Lichine briefed me on wine-tasting in his own cellars. ‘Always swish the wine around in your mouth clockwise for Bordeaux, counter-clockwise for Burgundy. Never swallow it; spit it out. 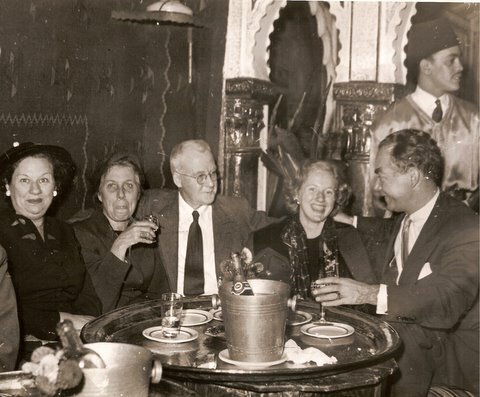 David Morgan hosted a party in an Arab cabaret. 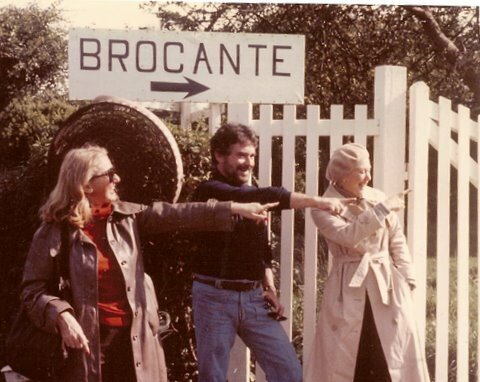 Can't remember the couple in the middle but that is my mother on the left with a sort of "yes I'm the chaperon" look on her face. That’s enough looking back for now even though I only look back to happy occasions. I’ve got to get ready for the New Year and so it’s time to start planning for the next trip to Paris! Happy New Year wishes to all of you. Look up, look ahead, don’t look back to old sadness but glory in happy memories and move on searching for what is good is my wish for everyone. Love this blog, Bev. I am with you. I am not much for NYE either! Love your photos of Paris. Great treasures. You need to write a book about all of your grand adventures! Happy New Year! 83 I’ve still got a lot more happy memories to make. today. A good start for my year, the Chinese Year of the Dragon. And yes about London being special too!